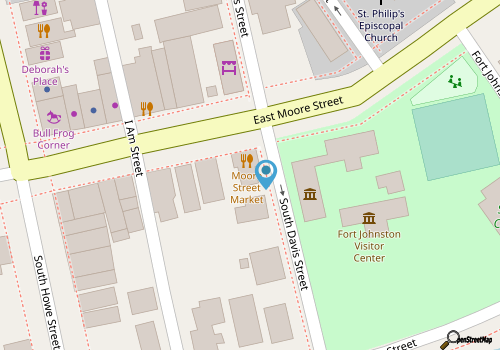 Moore Street Market is an eye-catching destination for breakfast and lunch that’s found within a historic former home in the heart of Downtown Southport. Located just a shell’s throw away from the waterfront, and featuring an ever-changing selection of wonderfully fresh sandwiches and deli-style fare, this cool eatery is a fine introduction to Southport’s laid-back, flavorful, and sometimes a little eclectic dining scene. The menu changes regularly, but has a heavy focus on coffee house-style drinks, salads, soups, and sandwiches, which can range from classic egg and cheese bagel sandwiches in the morning, to freshly grilled Paninis for lunch. Newcomers will want to first check out the daily specials menu, which is written on an exterior chalkboard, and which can include a nice selection of both a.m. and midday specials. Look for Specials Board regulars, like the Smithville Club with Black Forest ham, Ovengold turkey, bacon, cheddar, lettuce, tomato, and mayo on toasted wheat, or the Noah’s Reuben with corn beef, Swiss cheese, sauerkraut, and 1,000 Island dressing on grilled rye bread. Always fresh tasting and easy to enjoy in the cute and historic interior or on the go, Moore Street Market is a must-stop for anyone in the mood for a refreshing but filling breakfast or lunch. Call (910) 363-4203 for current hours.